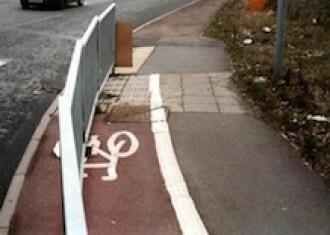 Space for cycle lanes – it can be found! Whenever I tell people about my dream of having some decent cycling infrastructure in the UK, I am frequently met with the same point about there not being enough space on British roads. The general feeling is that roads are already too narrow, and that there simply isn’t any room to accommodate the type of segregated cycle lanes that work so well on the continent. In each case, the cycling provision in the UK is rubbish or non-existent, while that provided on a similar street in The Netherlands offers a far superior cycling experience. Of course, if cycle lanes were better then more people would cycle, and if more people were riding bikes then there would be fewer cars on the road and so less congestion and less pollution. Everyone benefits, right? The following video explains how the Dutch got their cycle paths, and how their cities made the transition from being car-centric to being more bicycle friendly. What the Dutch have achieved is truly remarkable, and this is why I always hold them up as the best example for the UK to follow. They are the only country in the world able to boast the fact that more than a quarter of all their journeys are made by bike, and it would be my dream come true if we could achieve this feat in the UK. This entry was posted in Alternatives to Cars, Architecture, Bike Lanes, City Planning, Commuting, cycling, Cycling Infrastructure, Dutch Cycling, Dutch Cycling Infrastructure, HGVs, Kindermoord Campaign, Legal Issues, London, Politics, transport, Transport for London, UK, Urban Cycling and tagged bike lanes, British roads, cycle lane, cycle lanes, cycle paths, Infrastructure, segregated cycle lanes, UK, Urban Cycling, Urban management. Another masterpiece from our friends at NL Cycling. It’s not just people on bikes who benefit from good infrastructure. Check out the video and see for yourself. This entry was posted in Alternatives to Cars, Cycling Infrastructure, Dutch Cycling Infrastructure, Freedom, Transport for London, Uncategorized, Urban Cycling and tagged bicycle infrastructure, cycle lanes, cycle paths, Freedom, Mobility. Veteran journalist John Snow is also an avid cyclist. He has commuted by bike both to and from work every day for the last 40-odd years, and he raises some valid points about the dangers of riding a bike and the inadequacy of cycle safety provisions. He talks about the probability of ‘big rewards’ for the first politician to re-draw the urban map and prioritise cyclists and pedestrians. In terms of combating obesity, reducing pollution, and making our cities more pleasant places to live, I think I can see why such a measure would be well received. He states that, as humans, we respond to our surroundings. On the issue of cyclists who flout the law, the point he makes is that good behaviour will come when there are good provisions to protect and facilitate cycling. At the moment, it is a dog-eat-dog world out there on the roads; as the underdogs, cyclists are therefore put in a position of vulnerability, and have to make the most of their situation. Snow doesn’t condone bad behaviour on the roads, but he can at least appreciate why it happens. This entry was posted in Alternatives to Cars, Commuting, cycling, Cycling Infrastructure, Dutch Cycling, Dutch Cycling Infrastructure, Legal Issues, Politics, Strict Liability Laws, Transport for London, UK, Uncategorized and tagged bicycles, cycle lanes, cycling, Infrastructure, John Snow, politics, TfL. In a bid to save lives and reduce the fear factor preventing people from taking to two wheels, Bristol is to announce radical new proposals which will make it Britain’s first city to adopt a truly Dutch-style network of cycle lanes. Already the UK’s top cycling city with an estimated 16,000 regular cyclists, the 100 miles of cycle paths are due to be operational as soon as Spring 2014! In contrast to this fantastic news, the national picture is comparatively bleak. With cycle uptake ever on the increase, the number of cyclists killed or injured on Britain’s roads is at its highest for three years: 118 deaths and 3,222 injuries recorded in 2012. Although these figures represent regrettable injuries and tragic loss of life, statistics like these are what motivated the Dutch to unite as a nation and demand the changes that led to their precedent-setting infrastructure. 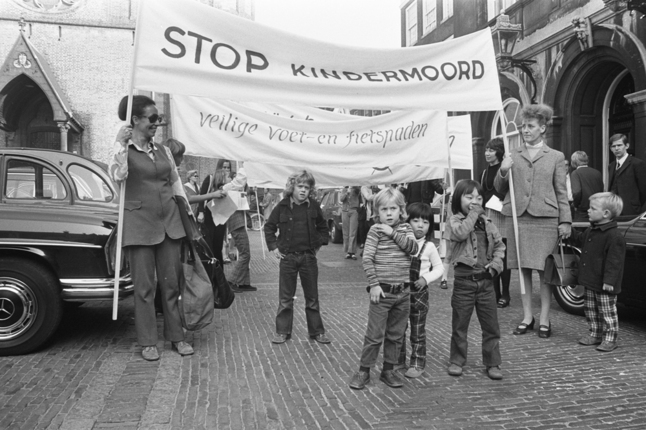 STOP KINDERMOORD – The famous culture-shifting ‘stop child-murder’ campaign that followed years of rising deaths on the roads. 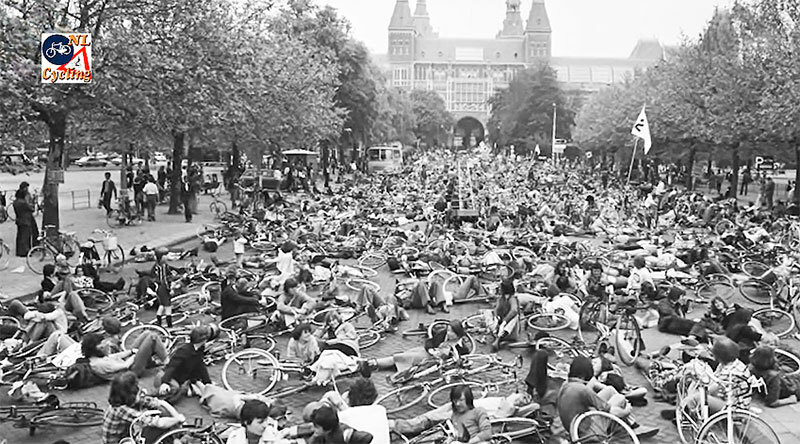 The Dutch made their voices heard through dramatic protests, like this one on the museumplein. In other (related) news, a new peer-reviewed study has revealed that financial investment in cycling infrastructure can increase the share of journeys taken by bike. This might seem like the predictable answer to another do-bears-poop-in-the-woods sort of question, but it’s not always cut-and-dried that spending to achieve a goal actually works. Look at roadbuilding, for instance: billions of pounds are pumped into constructing new roads in order to reduce congestion, yet congestion keeps on increasing. Ridiculous, unnecessary, and obvious as it seems, it’s still good press. Click here for the Guardian article. This entry was posted in Alternatives to Cars, Commuting, cycling, Cycling Infrastructure, Dutch Cycling, Dutch Cycling Infrastructure, Kindermoord Campaign, Legal Issues, Politics, transport, UK, Uncategorized and tagged Bristol, cycle lanes, cycle safety, cycling infrastructure, Dutch-Style Cycling, transport, UK cycling. I just came across this video (embedded in the link above) and after 10 seconds I knew that I had to share it. The movie illustrates the whole ‘bikes > cars’ philosophy, and shows how it can be made to work for everyone’s benefit even in a busy capital city. When you put bikes first and cars second, the whole urban environment is transformed for the better. One of the interviewees talks about how people are connected when they are on bikes and I completely understood what they meant – having lived in Amsterdam for a year I quickly picked up on the shared mentality and emergent camaraderie that exists between people on bikes and stands opposed to the isolation of the motorists. 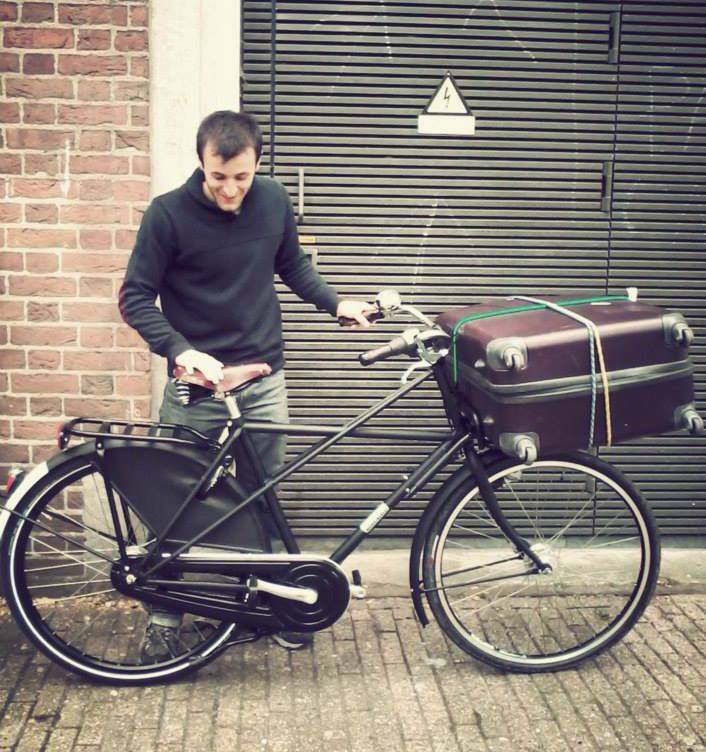 This entry was posted in Alternatives to Cars, Commuting, cycling, Dutch Bikes, Dutch Cycling, transport, Utility Bikes and tagged Amsterdam, civilized, courteous, cycle culture, cycle lanes, cycling, Dutch, dutch bikes, good vibes.